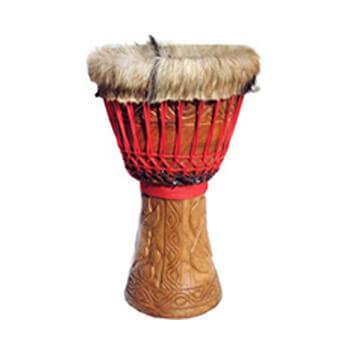 With a wooden (Twenaboa) shell & topped with thin goat skin these beautifully crafted and carved drums are the real deal. Sourced from Ghana, they produce a crisp, bright sound. These Ghanaian Djembes have a great range of sounds and look good too. The solid, hand carved shell features traditional Adinkra carvings. They offer a deep bass sound, a warm tone and a powerful slap. A great all-round drum for any level of playing.